The Nigeria Army has concluded its Exercise Ayem Akpatuma (Cat Race) in Benue, Taraba and Kogi states. 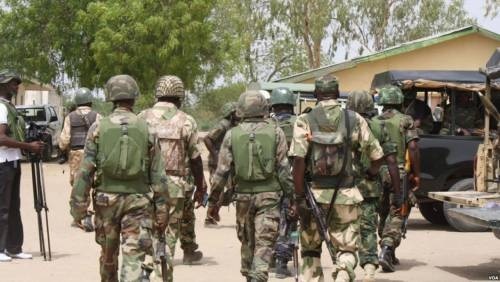 Exercise Ayem Akpatuma, which was set up to combat insurgency in the North West and North Central part of the country, was to conduct other operations of the army aside from war. Texas Chukwu, Director Army Public Relations, maintained that the despite some challenges faced in the cause of carrying out the operation, the exercise recorded "tremendous success". “The Exercise was also aimed at further sustaining Nigerian Army’s constitutional roles of defending the territorial integrity of Nigeria as well as aiding the civil authority to maintain peace and security. Exercise “AYEM AKPATUMA” recorded tremendous successes in spite challenges," he said. Texas further said that having consolidated on the gains achieved, the Army’s effort of ridding the affected areas of militants and other criminal elements, the Nigeria Army would be concluding the Exercise AYEM AKPATUMA in Benue, Taraba and Kogi States. He lauded host communities for their cooperation while the exercise was on. The Nigerian Army launched the Exercise Ayem Akpatuma on February 20, to combat insurgency and terrorism in the northern part of the country. A series of arrest were made by the army during the exercise.